Teenage athlete Sydney Sullivan quietly battles an autoimmune condition at her second CrossFit Games. There are many things 16-year-old CrossFit Games athlete Sydney Sullivan is looking forward to after this year’s competition ends: going to the beach, eating an ice cream sandwich from the Manhattan Beach Creamery and getting a liver transplant. About three and half years ago—at around the same time she started CrossFit—12-year-old Sullivan was diagnosed with autoimmune adolescent hepatitis. The condition is one in which a person's own immune system attacks the liver, causing swelling and liver-cell death. Swelling worsens over time. If left untreated, the condition can lead to permanent cirrhosis—a liver disease caused by liver cells working improperly—and eventually liver failure. The condition comes in two forms: Type I, which can occur at any age and is more common among females, or Type II, which is less common in the general population but more common among children; it affects girls ages 2 to 14. Sullivan has Type II. She also has an enlarged spleen. In January, doctors in her home state of Oklahoma decided to put her on a waiting list for a liver transplant. Since last year’s Games when Sullivan won the Teenage Girls 14-15 Division with six first-place finishes in seven events, she’s lost roughly 15 lb. She’s also lost some strength. Her max squat clean, for example, is 185 lb. During Wednesday afternoon’s Squat Clean event—the third and final of the day—she recorded 158 lb. for a last-place finish in the event. At the end of Day 2, Sullivan was in sixth place overall with two second-place finishes, two sixth-place finishes and a 10th-place finish in Event 5. After her transplant, doctors have told her, she’ll be faster and stronger. And she’ll be able to gain weight. Right now, the 5-foot-7 athlete is 120 lb. Despite her struggles, Sullivan has kept her cool. As she began Tuesday’s opening event involving 205-lb. deadlifts, GHD sit-ups, double-unders, rope climbs and wall-ball shots, commentator Cherie Chan described the teenager as “poised.” Perhaps that’s why few noticed Sullivan’s tears both during the wall-ball shots and after the event ended. The wall-ball shots felt more difficult than usual and her pace slower than normal. But by the time Wednesday rolled around, Sullivan was the definition of composure. After the day’s final workout, she said her goals for the three days were “do my best, learn from it, just have fun.” At the moment, she mentioned nagging discomfort in one knee but nothing of her autoimmune hepatitis. It wasn’t until her coach, Dennis Berry, started talking about her longevity in the sport that Sullivan’s condition was revealed. When asked if Sullivan’s composure was learned from her parents, her mom, Judy, laughed and denied credit. Judy also does CrossFit with her daughter at CrossFit Jenks. And although her condition has negatively affected her fitness of late, Sullivan noted that CrossFit has helped her condition. Her esophageal varices—enlarged veins in the esophagus that typically develop when blood flow to the liver is blocked—have significantly improved over the past year; her doctor has pointed to constantly varied high intensity functional movement. Sullivan no longer has to endure regular invasive scopes. Mentally, the condition has taught her to keep going rather than the easier option of giving up. “I’ve been through more than other people,” she said in her mild, unassuming manner as her eyes filled with tears. 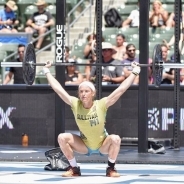 To consider her 2016 Reebok CrossFit Games a success, Sullivan said the markers would be that she had a good time and made it to Thursday’s final event. “She thought about it after that first event,” her mother added with a smile. Berry said he is not placing any emphasis on first, second or third place. Sullivan, he noted, is special.